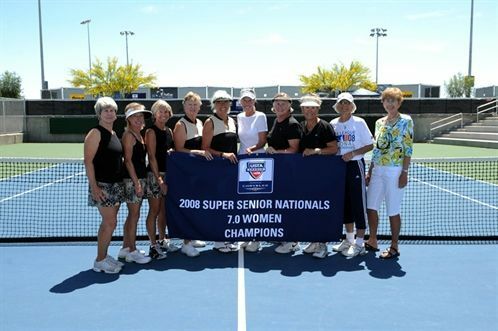 A Tucson women's team representing the USTA Southwest Section, captured the national title in the 7.0 division at the 2008 USTA League Super Senior National Championships. The event was held at the Surprise Tennis and Racquet Complex in Surprise, AZ, April 24-26; it was the first time	a National League Championship was hosted there. We extend a heart felt CONGRATULATIONS	to our "home-town" team - thanks for representing not only the USTA Southwest Section but Southern Arizona tennis as well!